I managed to find a dry day to take some more photos of the motte and bailey castle at Aldingham, and the nearby moated manor. The photos are, in my own humble opinion, the best I've taken of this site, and were aided by the new access that the land owner seems to have provided. The footpath that runs East from the A5087 is unchanged, but once onto the coastal path, and walking North towards the castle earthworks, the narrow path is marked on either side by an electric fence. Where it meets the motte, the path then continues down the hill towards the moated manor, giving good access and views of the water filled moat. Above. The motte can be seen to the right of the deep ditch that survives to a depth of about four feet, running West to East for about a hundred yards. Above. Another view of the deep, straight ditch to the North of the motte. Above. A closer view of the North face of the motte, with the ditch visible to the left. Above. A view of the Southern face of the motte from the newly created footpath. Above. A view of the motte taken from the roadside about a quarter of a mile to the North. The moated manor can just be seen in the bottom left corner of the photo. Above. A view of the motte from the roadside. There is very little parking at the roadside, and I'm not so sure that residents are keen for visitors to use what little is available. If you don't want to walk the mile or so to the castle, it can be viewed over the hedges from the roadside. Above. 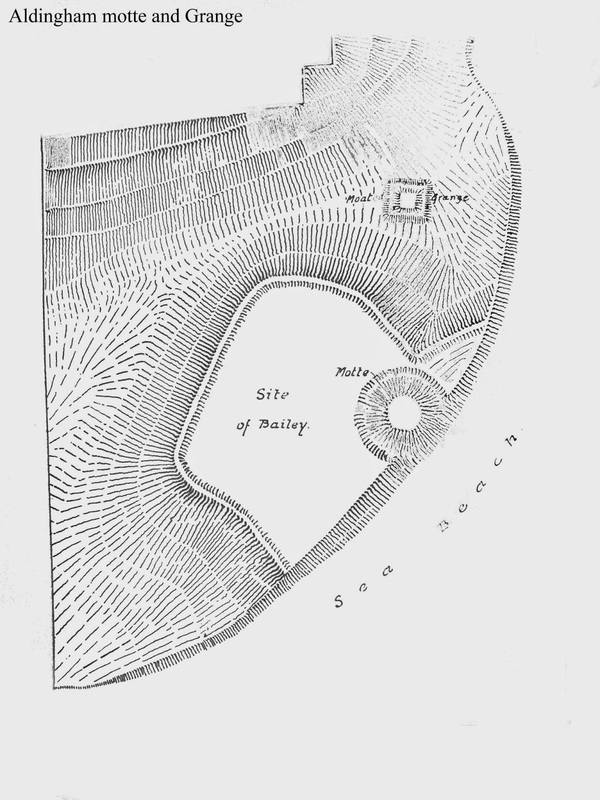 Old map of the motte, its bailey and the grange to the North. Both the motte and the grange were held by the Fleming family as part of the Honour of Lancaster up until 1227, after which it passed into the hands of the Abbot of Furness. The De Harrington family were granted the rights to empark in 1341, possibly creating a dear park for hunting. This may have also included the estates of nearby Gleaston Castle. Check this link, Aldingham Motte find report, for a great run down of finds excavated from the motte and the surrounding area.